What is motivation? If you use Firefox, as I do, you can type “Define Motivation” in the address bar and Google will provide some quick answers and some links for more answers. The definition at the top gives the best answer to the question and I used that one to copy/paste into this post. Pretty simple. To motivate someone is to get them to do what you want or need them to do by giving them incentives. Lacking motivation can be called lazy. Having motivation can give one the title of “driven.” We can motivate others, we can motivate ourselves. However, to have motivation, we have to have a goal. A reason. Something that inspires us to motivate ourselves. So, how do you motivate a 6 year old? What can you do to give them the goal? Something to look forward to? Most children are driven by instant gratification. That means, they want the bonus or present or item they thought of and they want it right *NOW*. As parents, we have to derail that slightly while still giving them a reason to do what we know they need to do. This could be applied to nearly all training in a young child’s life. It could even be a toy that someone else is using (motivate them to wait patient for the toy or motivate them to give up on that idea and do something else). One of the goals of a mother (or father, if you will) is to provide the proper motivation for a young child to grow strong and tall, learning much in school and having some measure of fun in the process. We motivate them to roll over when they are tiny. We motivate them to crawl, stand, walk and run. Well, maybe not run. If you’re like me, the running part of a toddler is scary. They tend to simply run without thought of where they are going. So, we motivate them to slow down and look where they are running off to. There are many types of motivation. We could use spankings (if we’re of mind to do that), we could use rewards, treats, presents. We could use grounding or sitting in the “Non-Hyper Chair.” We could restrict them from something they really want as a motivation to do what we want them to do. The reasons and types of motivation we use on our children are endless. As mothers, we are constantly modifying and coming up with new ways and methods of motivating our young. What works today will not work tomorrow and what works tomorrow may not work a week from now. A lot of Caiden’s motivation comes from candy. He’s a child and he loves his candy. We keep quite a bit of small candies around for motivation when I need him to really sit and get something done. Spankings and grounding, restrictions and taking things away works sometimes. His biggest motivation is Minecraft. I think the game is excellent for him, by the way. It drives him to learn and figure things out. He is building houses, he is learning how electronics work (making doors open automatically), he is learning how to type and remembering different commands in the game. And, of course, he’s having FUN. I went to his Parent-Teacher Conference with Dad on Monday. It was “Student-Led.” By this, Caiden was working with his teacher to tell us how he was doing in school. As always, his teacher reports he is exceptionally bright. He can do so much and the world is his oyster! He was to take a … placement test of sorts. The highest score is a 900. In the beginning of the school year, he scored an 828. This placed him at reading comprehension of a 2nd/3rd grader and he was just starting 1st grade. Mid-year, he scored in the 700s. This last time, it said that perhaps he should still be in Kindergarten – his score was in the 500 range. The computer went too slow. He got bored. He wandered off. He changed settings on the computer (the teachers still haven’t figured out HOW he did that). He stared at the walls, played games with himself in his head. Instead of waiting patient for the slow computer and getting the test done. The teacher suggested that it was possibly the fact that he plays on the computer at home and the one at school is too slow. He’s learned to expect so much from a computer and the one at school just isn’t cutting it. Ok. I’ll buy that. So, I’ll keep him off the computer except on the weekends. She suggested perhaps a diet change would help him. I’ll have to tell Jen that she can’t do so many carbs in the mornings. Done. Of course, when my stitches come out, I’ll be able to start cooking again (I can’t rightly wash my hands so I’ve avoided touching food at all costs). And then, of course, we talked about motivation. What could we do to make him care? To make him want to achieve all he can possibly achieve? No two children are the same. Mothers know this. I’ve got two different children in my home. So, what can I do to give him that incentive to motivate and do what needs doing in school? Just getting good grades should be enough but, seriously, how many of us really care what the grades are? When I had my store, I didn’t look at my worker’s grades – except for when it came time to show me their As. As got them $$ from me, as the owner. I couldn’t give them very many benefits but I could do that and it was excellent motivation for them to continue to do good in school while working for me. We talked to Caiden. Told him he had to do better! He had to take that test and do the absolute best he could possibly do. We promised dinner at his favorite restaurant if he would take the test. Nothing. On Tuesday, he fought his teacher about taking the test. While talking to him on Tuesday night, I happened on an idea. 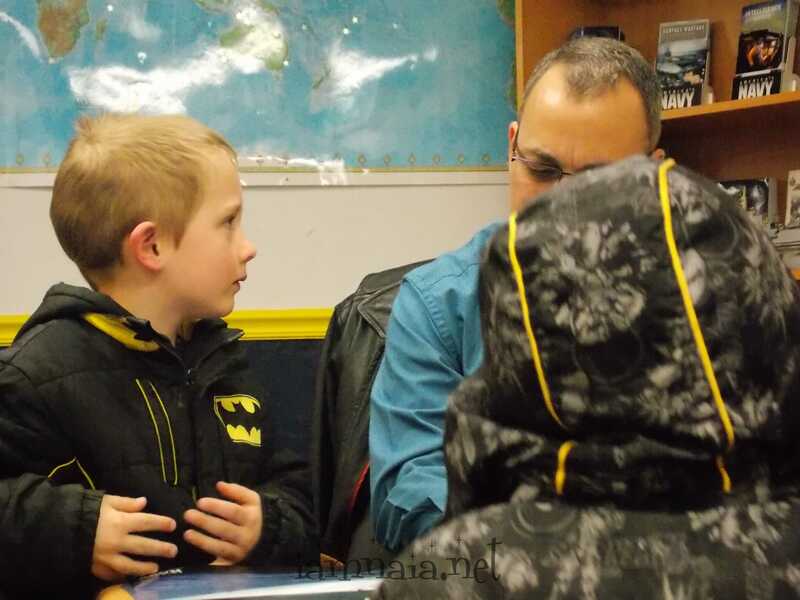 He arrived at school at roughly 8:25 on Wednesday morning and went to his teacher. She took him over to take the test and he came back by 8:45 a.m. with a score of 823. He scored only 5 points lower than the first time he took it at the beginning of the school year. His teacher sent me a text, telling me about it. Jen and I started running around town, looking for a picture of the F-14. Finally, Jen made a wild phone call and found someone who could print a picture and even put words on it, if I wanted. The cost was just about right, so I went with it. After he scanned something in for me, I actually sat down at the computer and put together my son’s motivational poster for his wall. Yes, I put the X’s over his last name. It’s only fair. And, yes, I did design it. I purchased a picture of the F-14 and then added my mommy-touches to it. 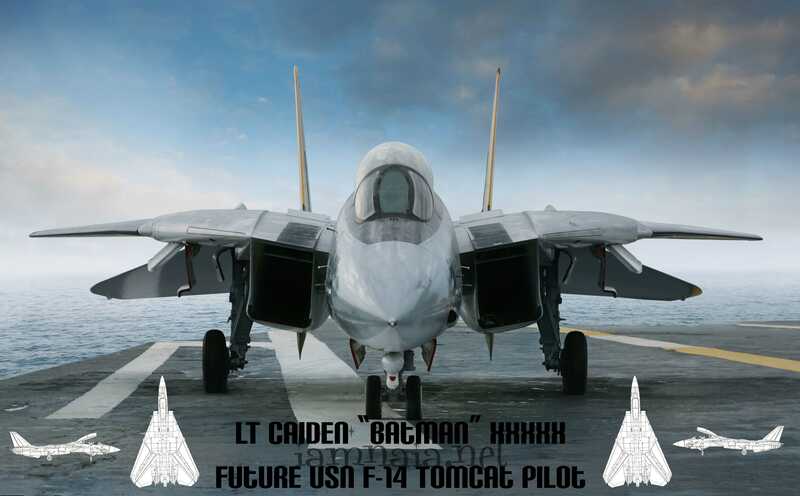 You have to understand, the F-14 Tomcat has been my one great love for most of my life. When I was 13, I didn’t have rock stars or Barbies. I had posters of F-14, F-16 and Switzerland on my walls! I’ve been in love with this plane since I knew what they were and it was my driving force for joining the United States Navy. It never happened but I did get to fly a boat of a plane (the P-3) and got to sit in the cockpit of an F-14. I’ll live vicariously through my son when he gets in the Navy – even though they no longer fly the F-14. He doesn’t need to know that part right now. He’ll figure it out later. While this was printing out (took about an hour and a half), I went and talked to the Navy recruiter here in town. I told him the situation and asked if he could help me solidify the motivation I was working on with my child. He agreed and we set things up to take my son over there after school. I gave the recruiter the poster (when it finished) and the movie Top Gun and told him that he can surprise my son and say that they came from the recruiter, not me. He had a few things he could pass on to my son, as well. 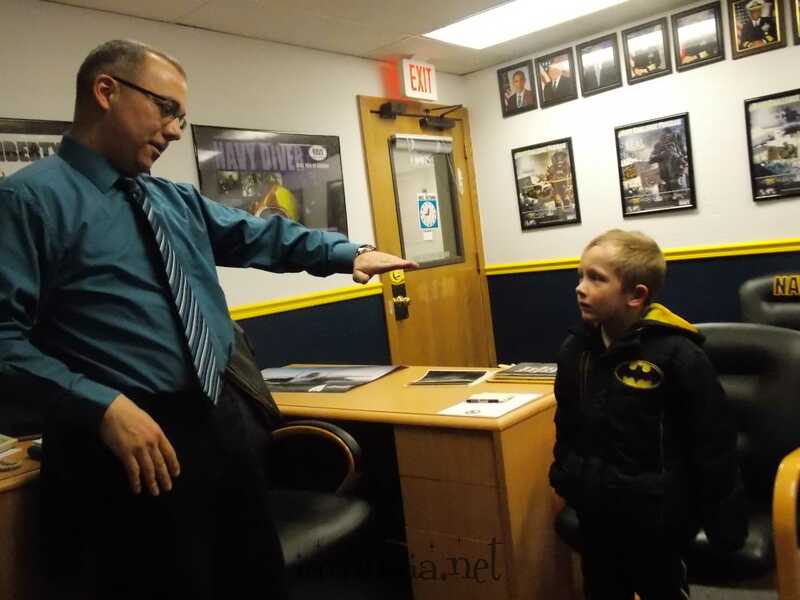 Most of the time, Caiden was in awe of the LCDR that was talking to him about the Navy. It was so much fun watching him! Occasionally, Caiden would get off track but the LCDR (Lieutenant-Commander, USN) did great pulling him back in. He learned a lot and continues to talk about it. 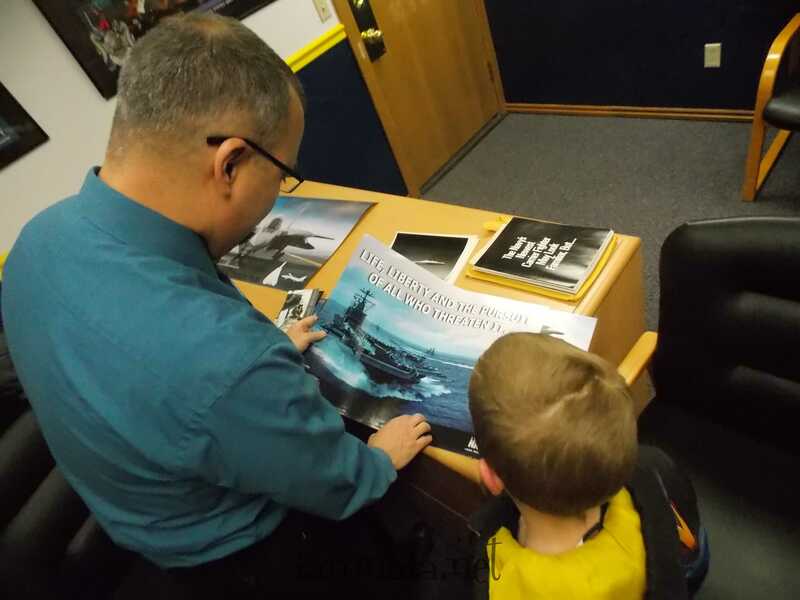 Showing Caiden some Navy promotional posters that he was sending home with him. The poster I created was on the desk the entire time and Caiden noticed the picture but didn’t realize it had his name on it and it was for him! 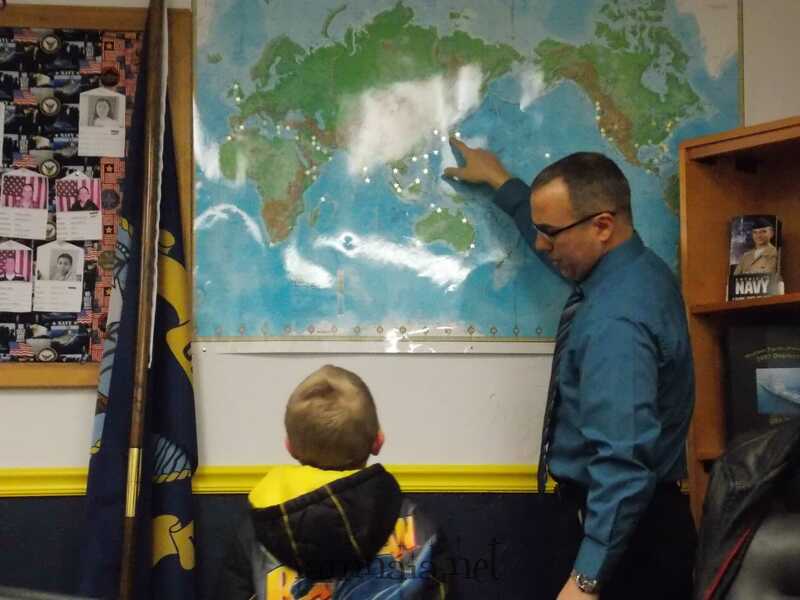 Showing Caiden all the places he could go as a Navy Pilot. The LCDR had a great time showing off all he did in the Navy, as well. You could hear it in his voice. 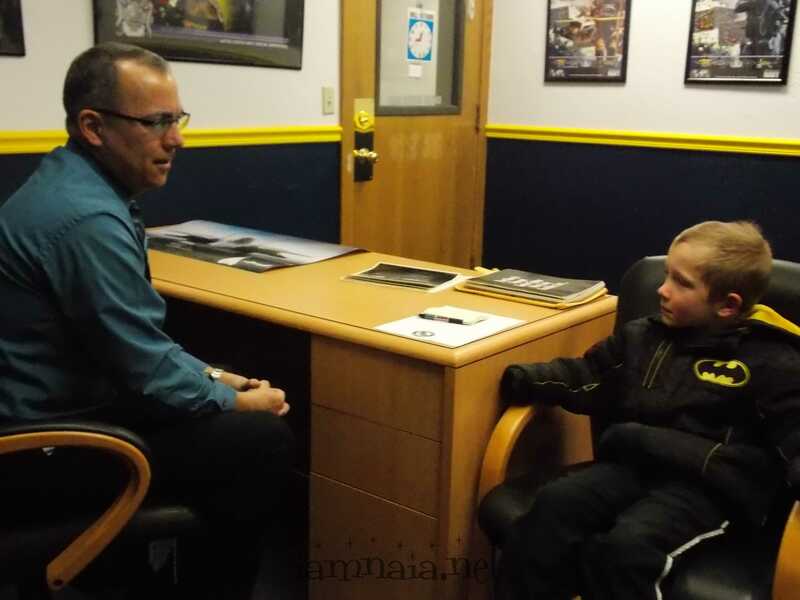 I do believe this is the youngest recruit they’ve ever gotten. 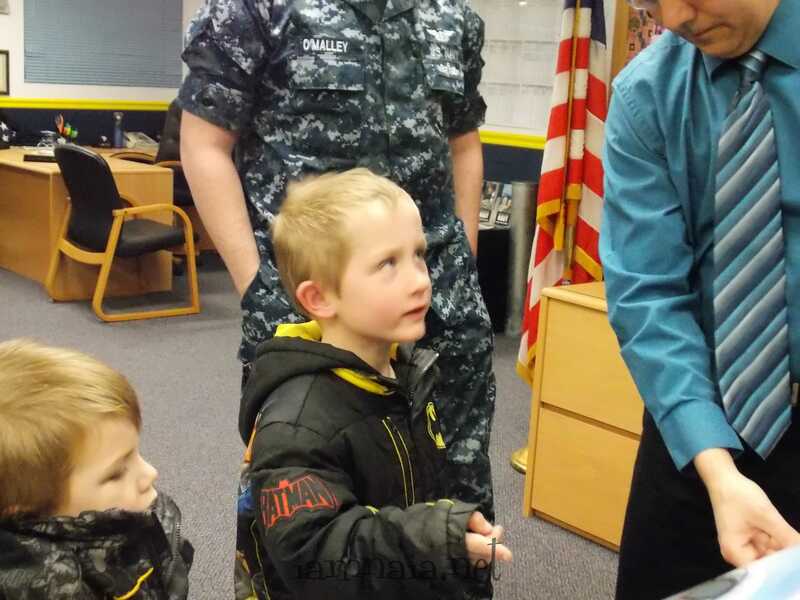 Look at his eyes glued to the LCDR! At this point, I let Jen bring Brendan in. It was starting to wind down and I thought Brendan would enjoy it. On Thursday, I let him take the poster to school and tell all his classmates about it. He was terribly excited, I’ll tell ya! And now, we have a constant reminder of why we have to do really good in school. It just might be a long-lasting motivation for him. As of this morning, this is his bedroom walls. 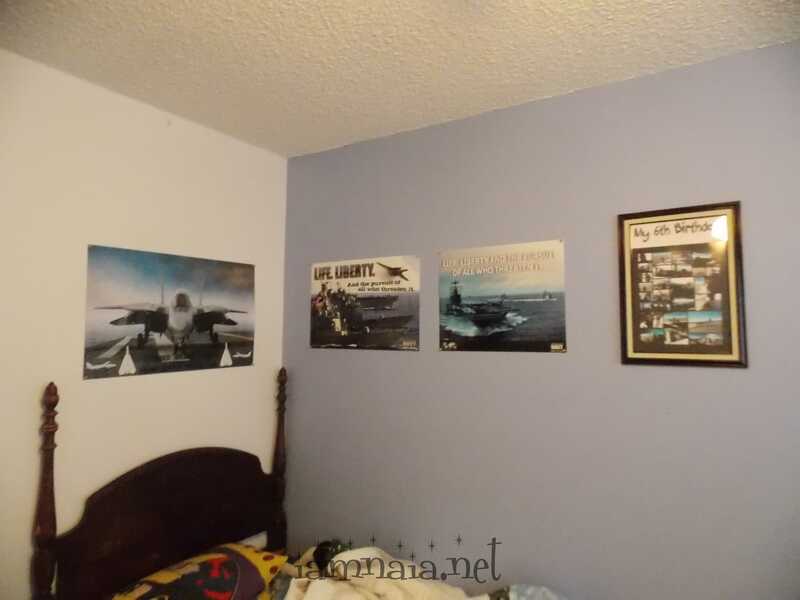 From left to right: The poster I made, two recruiting posters and the picture in the frame on the far right is when he went up and flew a plane for his birthday. It’s starting to look like the wall I had at 13! What do you think? I’m thinking I hit the nail on the head as far as motivation goes. Now, to figure out how to motivate Brendan to stop peeing his bed at night. Grrrrr…. A Mom’s motivational job is never done.